It was the night of the lunar eclipse, the fourth in less than two years. 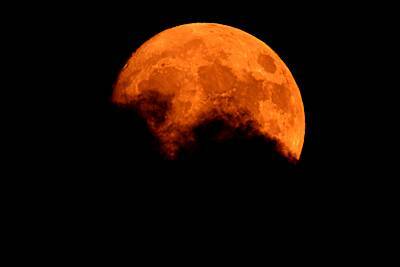 There would be a blood moon rising in the east, and it would hide in Gaia’s shadow at the appointed time. When it did, everything that had been predicted would come to pass, but few would have eyes to see. Despite this blindness, everything would be in perfect alignment and all in precise order, if all actors in the prophecy performed as they were directed to do. Over the next few hours, the moon meandered its way towards its designated place at its appointed time. When all was ready, the moon passed into Gaia’s shadow at the exact second it was designed to do. Thus completed, the moon acted out its part as humble servant in the unfolding cosmic drama. It was obedient to the laws that compelled its orbit. All would now be fulfilled, if all that was said was true. The moon was now hidden, and all of its light was gone. When the moon completed its role and purpose, the valley below that was once full of light fell into darkness. In doing so the valley plummeted into visual oblivion. The gentle breezes of that had whispered throughout the formerly peaceful autumn night died. They perished so a single gale force of wind could be born. One and only one burst came forth, as the strong breath of the sky subsided into nothingness. The gale that roared expired almost as soon as it made its entrance. Once it passed through the valley, all was still. So dark it was, there were no shadows. No deed good or bad would be seen by those without vision. Few were there to witness the moon slipping into Gaia’s shadow. This was because almost every one of the diurnal residents of the valley rested in oddly peaceful slumber. After all, this was the fourth of such moons in such a short period of time. It might be said that the novelty of the eclipse had worn off to many. Now, it was like a guest at a party who had outstayed his or her good graces but wouldn’t get the hint to leave. Even the night watchers such as the owls and the coyotes and the wolves were oddly silent, quite bizarre this was seeing that the moon had been full and ripe before its disappearance. It was as though the vast majority of all the creatures were so asleep to themselves that they had no awareness of what was passing right in front of them. So very few were awake this night that the moon slipped away without any fanfare or concern. Yet in a way, the human souls of this valley had prepared for the festivities of this night, all while being blind to the significance of what they did and the part they unwittingly played. Although it was not quite October and the first days of autumn had just occurred, there were already goblins, goons, ghouls, ghosts and other assorted demons decorating the driveways, porches, doors and windows outside the cozy domes which sheltered the good humans of the valley, along with spidered cobwebs real and imaginary. These entities and spirits, except for the spiders nature created, had been invited to these homey places in the very early anticipation of Halloween festivities. All of them were unaware that they were characters in an unconscious regional competition for spookiest house of the month. Every one of the characters, including the spiders, rested until the surprise wind blew. When the gale blew its single breath, the skeletons, witches and scarecrows danced in a frenzy. There were ugly witches with enormous corns, moles, and warts all over their sickly green faces. There were pretty witches with rose colored skin and raven black hair with flowing gowns. Even the spiders natural and otherwise scurried in their webs, each in its own individual way. These and so many other characters were at the gala this night. There straw concoctions that had been borrowed from the field and replicas that had come from the local discount stores, orange pumpkins forged from plastic, wood and the earth. The plastic ones were hanging pumpkins, and they were the ones that participated in the dance. The ones from wood and the earth rested on porches and benches. They were only spectators, but they were there for the dance like all the others. There was even a strange representation that could have resembled a woman, or perhaps not, bright white with light like it contained the universe of colors and lights in its very being. The female-like entity held what might be called a pair of balance scales in her right hand. Its talisman shook for a moment while she danced with the others during the solitary breath of the wind. The female entity and all of the others except the wooden and earthen pumpkins danced only for a single moment. But dance they did, like the earth had shaken them awake. Then, these performers of the nighttime slowly returned to the lifeless stasis that they came from, descending into the same state as the wooden and earthen pumpkins. The female-like entity with its twin balance scale was the last to stop its movement. Because it, like all the others was inanimate. What else could it, or she, possibly do but stop in the presence of a stronger force like the wind? Her or its movement or lack of it meant exactly nothing. Other than perhaps, a trick of the mind or silly superstition. Upon the horizon, the valley transformed itself into two high hills, one on either side. One hill in particular was considerably higher than the other. It was as if some demigod or demigoddess had dared to soar in the air on the first try, collapsed in such exhaustion that the valley was created, and then in a herculean attempt vaulted himself or herself almost half the height other before resting in divine splendor. Divine, because upon that second hill was a harvest of trees unlike anywhere in the valley or the little sibling that lived below it. There gathered all the trees that represented the culture of this region, and a few that did not owing to the creativity of several that had created diversion from some transplants that had traveled from far away. Birch cousins that normally did not know each other were familiar to each other here, forming clusters huddled together like a gathering of souls. Apples of all kinds were here, as were pears and walnuts and a rare chestnut or two that had hidden itself from the pandemic which had tore through its relatives on previous occasions. To get to this special place, one had to navigate the terrain of hard, high rocks that pitched at a near vertical level for almost one hundred feet or about thirty meters. There were little nooks and crannies throughout each and every boulder and narrow trails between the rocks that made a successful free solo climb an outlier of possibilities, a salivating temptation to the daring, drunk and wild. But, these little footholds weren’t as easy to grab as many hoped. Additionally when heavy rains came as they had recently, the rocks became quite slippery. Some who had tried to navigate the territory had simply failed in the attempt, serious adult climbers included. Others were forced back when they fell to the ground, some dying from snapped necks or trauma unseen as the terrain which had carried them faithfully to this place turned vicious when they crashed from high places not intended for them to go. So despite its temptation to be mastered, there were many who were called to the hill but few were chosen to scale it. Most avoided it all together. Because of its treachery and its special flora, many of the human residents called this place special, like a sacred temple. The unusual landscape and inherent challenge in getting to it was a bit of a regional attraction, but surprisingly hidden considering it was the age of worldwide instant videos. That small crowd loved the mountain, thought it was a place of wonder. But it was only some of the people, which translated to only a few adults and a portion of adolescents and children that still converted to less than a majority. The rest of the busy big people just saw it as the high hill that blocked most of the sunsets, making the nights longer than they had to be. But they had become accustomed to it all, which is why this the fourth night of the hidden moon made a difference to only a few. A few of the more radical children and adolescents loved this shrine. This was mostly because they were warned to stay away from it from concerned parents and harried guardians. They loved to challenge each other to see who would reach the top. Only one of them got there on a regular basis, and he was the envy of all the others for this reason. The rest would slip and fall, hoping for better luck next time. But better luck never showed up for them, at least not with any consistency. Only the thirteen year old adolescent named after prophets and constellations succeeded, each and every time regardless of what the elements threw at him. His name was Ezekiel, and people at first introductions would call him Zeke. He preferred to be known by his middle name, which was Hunter. Now that he, along with his dog Rigel the bloodhound, were known to be masters of the mountain, he had the street cred amongst his peers and many adults to be called whatever he wanted. So, Hunter he was. He was a priest in a religion that lived outside the walls of convention and rules, but some religions live beyond a scripture that must be read behind closed doors. There were times when Hunter and his dog Rigel climbed up on this hill in the dead of night, when the home that they both shared was too chaotic with the drama that accompanied the rage of the ones that supposedly knew better than them in order to care for them. As objects smashed, voices raised, and fists were thrown, they both ran from the darkness of light into the light of darkness. They liked to come to this highest place on the hill, Rigel to smell the life around him and Hunter to look into the sky above. Although Rigel didn’t know it exactly, Hunter’s favorite constellation was Orion. They had both been born under it, and what Rigel also didn’t know was that like Hunter who was really Zeke, Hunter had also renamed Rigel. Like Orion’s dog before, Rigel was to be named Sirius. This had prompted Hunter’s drunken stepfather to laugh at the young puppy constantly, taunting him with rants of “Are you Sirius? You can’t be Sirius! Seriously, I can’t be Sirius and wait, you think you are Sirius?” and other similar insults maligning all involved. This constant harassment eventually prompted a young Hunter to throw punches for the first time in his life in the direction of his abusive stepfather. Luckily for young Hunter, several adults who cared enough happened to be on the scene. They intervened, and saved Hunter from being beaten even worse than he ever could. Because of them, Hunter was saved. And in a sense, so was the young puppy, as he was promptly renamed Rigel, named after Orion the Hunter’s brightest star, the one that made up his left foot. Now, when Hunter’s stepfather devolved into his rants about to be Sirius or not to be Sirius, he was written off as a fool because both Hunter and Rigel knew what to answer to. Their identities were strong, and they were not distracted by lies that posed as honesty. On this, the fourth lunar eclipse in such a short time, no human animals were there upon the sacred hill, not even Hunter. Given the difficulty of the terrain, this was not surprising for just about everyone but Hunter himself. But perplexedly, there was not even a solitary human soul at the base of the stone hill, not one. Not even amongst those who saw this night as sacred under the stars, a night not to be repeated for decades or centuries depending on the vision. Not even one to represent those who looked to the heavens and stars for guidance, or to tell them when the days of cleansing or harvest were to take place. No, not a single one. The reasons for this were numerous, if not pedestrian and typical for a busy social culture that sped so fast it forgot where the light went. For although there were those who subscribed to ancient networks of belief and inspiration in the valley, they lived in a world that twisted their spiritual circadian rhythms into a different psychic clock. There were bills to be paid and schedules to follow and children to feed. What of a moon that hid within Gaia’s shadows? The cloud of frenzy that called itself civilized did not recognize such a thing other than a passing fancy on the news sandwiched in between a social media video of a dog crashing into a water bowl, and a traffic report which showed the usual gridlock du jour. It would be like daring to speak a foreign language in place that had purged all traces of otherness diverging from the dominant mainstream. Shadows and moons lived under a different sphere that was no longer relevant, and so was not recognized. Thus, the world of supposed daylight forced its hand even beyond the reaches of sunset. The nighttime feast of the harvest moon turning blood red behind giant pillows of clouds blanketing the sky would be largely ignored. It would do no good for anyone to fall asleep at the wheel after all, literally and figuratively. Besides, it was a murky sky, and maybe the show wouldn’t be so good after all, some rationalized putting their guilt to sleep. And so, the high hill along with the valley slipped into shadows. Only one from the diurnal world was there to witness it, and he was not human. Which to many would mean, there was no one. The one who was there who was no one and not human arrived on the hill several hours ago. He remained there ever since the moment the moon had popped its head upon the horizon, the first moment of its own dawn not recognized by sun-worshipers. He had traveled this way before with his favorite companion, the thirteen year old human child was the only one to have successfully navigated this terrain to the summit each and every time without fail and without falling. The one who was no one and not human was the bloodhound Rigel, the dog who had once been known as Sirius. This was Rigel’s first trek alone here. All other times had been in the presence of his human friend Hunter. What had attracted this solitary animal to make this solitary journey for the first time in his middle-aged life? It was the smell of blood, a scent so strong it surpassed all others in the autumn night. Not the damp earth of leaves fallen, not the crispness of overripe apples as they fell to the ground, nor the tang of winter that seeped through earth and sky. As Rigel was a bloodhound, the fact he had detected the blood smell over all the others was not so surprising. What was unusual was that he had traveled alone to seek this blood source, without the presence of the human he loved so much. He had come here as a leader, and not a follower. Rigel had done this successfully as few others had, because even though he was a big dog and not particular known to be the most graceful of animals, the recent rains had surprisingly worked to his advantage by creating a crevasse of trails through rockslides from the soil high above by the tree line. All the leaves that had fallen remained meekly on the sidelines, away from his path. With the mud caked thickly upon the rocks and the leaves obediently out of the way, a makeshift path had been magically created that led straight to the top. This somehow worked in Rigel’s favor, which was fortunate as the animal was drawn to the summit that few traveled to by the smell of blood he could not ignore. The rains that had plummeted had only stopped today, and the smell of blood was fresh. Rigel’s nose transformed into a canine sleuth, determining that whatever that had died had done so today. Rigel went to investigate as only a bloodhound would investigate. There would have been no one else that would have noticed so quickly from so far away, as he was the only diurnal canine in his region with a nose such as his, and the humans far behind even them. The scent of blood compelled Rigel to make his trek as the sun set and the moon contemplated its rise. Rigel’s pilgrimage to this place today ironically could not have happened if not for Hunter’s stepfather, the one who so mercilessly taunted him and hated him, as well as Hunter’s mother who was so drained and wearied from days of struggle that her primary regard for Rigel was her intense lack of regard and strong indifference. There was a gate in front of the house that Rigel and Hunter shared with the stepfather and his wife, Hunter’s mother. Several times a week in a slow month, the stepfather left the gate open when he stormed from the house and/or stumbled in. As a result of this, stray cats and dogs would oftentimes wander into the yard. Every time the stepfather did this, he would accuse either Hunter of being careless, his wife for being stupid, or various ethnic groups for negligence if neither family member was around. In the end, many times he would resort to calling Rigel the dog Sirius on good days, and expletives on bad ones. Hunter’s stepfather would sound off like this, all while the gate in question still remained open and stray dogs and cats could get in and many times did. Today was one of those days where Hunter’s stepfather once again left open the gate that was purportedly the source of the Gaia’s woes if his melodrama was based on actual nonfiction. It was a day where Rigel just happened to be in the yard alone, because Hunter’s mother had forgotten to let him back into the house. Hunter was also absent, having been shipped off to football practice, an activity that parented him better than his given parents could on any given day. Today was also one of the few days where the world crisis of the gate being opened to the yard did not lead to a stray cat or dog to meander into the open house pet hotel. Thus, on this day of the blood moon rising and the open gate, Rigel had no competition from any dog or cat in the yard. Not even Hunter was there to guide him in what would take place next. Alone amongst the neglectful and argumentative bipeds in his life, it was here in the yard where the smell of blood reached Rigel. It was here that he began acting his part on the cosmic stage, due to a moment of chance created by small acts of neglect and omissions and set everything into place. Once out of the still opened gate, Rigel made his way though the fields and up the mountain until he had reached the base of the stone hill. He had done this in less than ten minutes’ time, the smell of blood had been so powerful to him. It only got stronger, the closer he got to the top of the hill with its great big rocks that few could navigate. But knowing the smell he sought was so close now that he’d come this far, he made his way up the stones and reached the summit where he had been for hours now, from the time of the moonrise to the time of the moon’s hiding in Gaia’s shadow. He sat waiting, smelling the odor of blood the whole time. This was where the blood’s scent was strongest, here in this primeval place. Yet strangely, there was no pinpoint where the source was coming from. No carcass, no struggling creature in the throes between life and death. Just the smell of the blood, the unusual trees, the moon hiding in shadow and the dog named Rigel. He waited, like a predator lying in wait for prey. When the moon slipped behind its veil to its appointed place and the single furious blow of wind ripped from the hill and dipped into the valley, the source of his hunt appeared. As he was naturally bred to do, he howled at the top of his lungs as only a bloodhound could do. And then he approached the quarry in the darkness, the sense of his smell the only thing he needed to detect what had drawn him here to begin with. Rigel the bloodhound would not have the words to describe what he saw, at least in language that was directly translatable to the humans who worshiped verbal speech like a demigod. What he did know was that when he found the source, he found not one, but two animals lying at his feet that apparently had not been there before, despite the scent that had signified otherwise. Rigel had no understanding of this, but it was nothing that he puzzled over. He only knew that he had smelled the blood of one before, but not the other. The one which was familiar, he had seen in the fields often out and about. This is the one he turned to first. He could smell the maleness of the animal, even as its life was spilling onto the grass below him. He placed his nose into the fur of the animal, which was about his twice his size. It smelled like game to be savored, a prize that he had never in his life savored alone in the wild like this. He howled once more, raising his head to the moon hidden behind Gaia’s shadow. When he lowered his head to return to his prey, the animal vanished with little trace other than the blood spilled from its body like a river. The animal that Rigel imagined he’d witnessed was a bull cow, a yearling. But this was neither here nor there, as Rigel would never use those words and in any event, the animal was gone. Perhaps the bull had never been there. So Rigel turned his attention to the second animal, who was less familiar than the first. This animal was considerably smaller, closer to Rigel in size. As Rigel approached it, the animal bleated at a high pitch, compelling Rigel to bark furiously at the struggling creature. The animal’s voice startled Rigel, as he had not heard the animal make a noise until now, nor had the smell he had given off indication that he was still fully alive. The blood that poured out of him ran like a river off the high hill and onto the rocks below. Yet as Rigel surveyed him, the animal remained alive no matter how much blood ran from him. He like the bull cow before him also reeked of maleness as he cried out. In the midst of this confusion and chaos, Rigel competed with the cries of the doomed creature by howling loud and hard, raising his head to the moon hidden behind Gaia’s shadow in some primitive supplication that he had no words to describe. Rigel beat out his rival for fanfare as the animal went silent. Thus victorious, Rigel lowered his head to return his focus to the prey. What he discovered as he did so was that the animal vanished with little trace, other than the blood spilled from its body like a river. The animal that Rigel imagined he’d witnessed was a goat, a yearling. But this was neither here nor there, as Rigel would never use those words and in any event, the animal was gone. Perhaps the goat had never been there. Rigel screamed with his howling bark, knowing what he had witnessed but having nothing to show for it. It had been imprinted upon him, this olfactory vision. Blood ran so fast and furious, it now created a river that flew fast and furiously towards the direction of the east where daylight usually made its first presence. This was a river that had never existed in the life of Rigel, never once in his life. And the memory of the bull cow and goat were written upon his nostrils. If he were a human forced into debate, he would never relent his position that what he saw was real. But he was a canine, and had the memory stored within him without knowing what it meant, or understand what to do with it. At this point in time, the moon’s captivity behind its shadow was at its midpoint. Rigel had no way of seeing it, but it was encased behind a reddish haze that made it seem like the skies were ready to bleed out upon the earth below. Strangely enough, a constellation was arriving upon the horizon at an unseasonal moment, out of sync with its scientifically designated time and place. The constellation that behaved so rebelliously was the constellation of Orion. Its arrival, like everything else, was beyond the comprehension of the dog Rigel. He also would have no idea that astronomers far away could not even see what he sensed, even with all their instrumentation that said otherwise, that something in the cosmos had shifted and no one had eyes to see. This universal blindness included even him, as he was a dog who saw better with his nose and ears than eyes to give him vision. But what Rigel was aware of was the roar of the newly made river. Its forceful travel ripped through his ears like fifty pounds of rocks. He could barely hear his voice anymore, and even he was beginning to go silent, though he couldn’t quite find it in himself to leave either. The smells were changing all around him, as mixed in with the metallic smell of blood were rich sweet and sour senses that varied in pungency and strength. These were new also, like the river. Rigel stayed put in his position on the hill. He was there to witness it all. This all happened at the median point of the moon’s hiding, as though all had been building to something that Rigel would never understand. All was dark beyond blackness. And then it was not. The light appeared as suddenly as the river had, and as abruptly as the gale that had blown and the bleeding animals that had flashed their existence before being wrenched away. The illumination appeared from the north, at a right angle to the direction that the newly formed river traveled. The source of the light was an apparition in white, brightened by its own luminescence. It was as bright as the moon had been prior to its hiding. It would be easy to make the analogy that whatever this entity was, it almost was as though it had borrowed the moon’s light for just this moment. Rigel himself had no words to make this analogy, but he did see the light as it got closer and closer to him. This was the only sense perception he had of this apparition. Even a bloodhound like him could not detect any sound or scent from this strange ghost. Even as it glided towards him, he only could see the light and nothing else. He stayed and he witnessed the apparition’s arrival, and did not run from what he saw. The apparition, which had seemed at first to have been on a direct approach to Rigel himself, stopped when it reached the source of the river bloodied with birth. Although Rigel’s vision was not his primary sense, he did see the light take on some kind of form. The form, which if he had the eyes of a human, transformed itself into the shape of a woman, so white with light it reflected every hue of color along the spectrum. Its eyes were blindfolded, which was strange that this could be distinguished given the brightness of the light. But a human would see this, if only there was one here with eyes to see. A human would also see in the entity’s right hand a pair of balance scales. The entity raised the balance scales high over its head with its right hand, and the river responded to it screaming and roaring in an ever increasing volume. But Rigel was not a human, he was a dog and saw what only dog could see. He witnessed the entity grow in size, form into a weirdly grayish yellow biped being with limbs and a deformed right hand with a monstrosity dangling from it. It was the river that got to him even more, as the river’s screams deafened him even as he howled in the night. No human would ever hear Rigel’s voice over the noise, not that any he knew if any were searching for him. In this new chapter of chaos, Rigel no longer detected the smell of blood. Something had altered in the scene before him, this he knew. Then just as suddenly all was quiet, and the strange ghost with scales of judgment was gone. All that was left was a bright red sky that Rigel saw in the same hue as the sickly green of the ugly witches holding vigil in the valley. Rigel had no way of knowing that a sky like this was unusual and out of sync, a sunset sky that had been late to the cosmic party because it had forgotten the address. He had more important things to consider. Along with the strange red sky above, he smelled a strange burning unlike anything he had experienced in his life. It wasn’t quite of wood nor of the man-made substances he had dealt with in his middle aged life. It was as though the air was on fire, but yet nothing around him burned. Nearly all the stars and the moon remained hidden behind clouds that seemed out of place in such a spectacle. Almost all of the members of the sky hid in plain sight, because the light blinded them into nothingness and they were no longer special, except for one. Only the bizarre appearance of Orion stood out amongst the crimson canvas. By now, its so-called Alpha star Betelgeuse nearly touched the enormous clouds that hid the moon. For a moment in time, it was literally the star attraction, the brightest child in darkness. It seemed to absorb all the light in the sky, like a black hole. If you didn’t know better, you could be tricked into believing that the star pronounced Beetlejuice would reign supreme, that perhaps it would even be brighter than the full moon at its brightest. Trickster that it was, like its namesake in the cult film, it was full of false promises that would fool the unsuspecting ones so absorbed in its light that they forgot what was beyond the obvious. For there was light beyond the trickster, and it was not long in coming. Far on the horizon, the star named Rigel rose from beneath the earth into the sky, shining as only the brightest star of Orion possibly could. In comparison, Betelgeuse was only a dim memory even as it still stomped its feet in despair at being upstaged. But the trickster had been ratted out. Now the real leader of the pack had arrived to reign over the sky, a dark knight coming to the rescue of the forsaken. Rigel knew none of the machinations of these celestial happenings, at least literally. His attention was directed to other matters. Like the burning, and the absence of noise from the newly formed river before him. He had no way of knowing that the woods around him were still dark, despite the orange tinge from the blood sky above. There was fire in the air, and this he knew, though he could hear no roar. This confusion consumed his being and attention until he was distracted from a new light source that once again emanated from the north at a right angle to the blood river. Once again, Rigel barked furiously, and howled at the top of his lungs. And once again, the light moved rapidly towards Rigel. At this, Rigel stopped his barking and remained absolutely still. This time the light was different. Unlike the light source which formed the bizarre judge with its balance scales, the light was a softer yellow and more diffuse. It was small and circular, centered at a place about a yard or meter from the ground. As the figure approached Rigel, it too took a form. Except this time it was of a male, very human in form though surprisingly its smell had escaped him in the midst of the blazing odor. As the male figure approached, the burning smell of the sky got stronger and stronger, which was puzzling and confusing to the bloodhound. Rigel’s silence turned into a low growl, but he still stood his ground. Once the figure crossed the top of the hill and reached the river, the smell became rancid. It then dissolved, transforming itself into a scent much more familiar to Rigel and infinitely friendlier. What it transformed into made Rigel yelp with gladness, and he ran towards the figure in delight. The figure whom he greeted cried out Rigel’s name in glee. Rigel leapt onto the figure, the boy of thirteen named Ezekiel who called himself Hunter. Hunter laughed as he was knocked over by his canine friend, his flashlight falling from his hand and hugging the bloodhound as Rigel licked his favorite’s human’s face. The flashlight, still illuminated but on the ground, faced east towards the river. Once Hunter could get himself out from under his favorite dog, he jumped in surprise. On the banks of the new river were trees he had seen only on television. There were palms, there were fig trees, banana trees and mango trees. Despite the recent frost, the trees were full of fruit. Hunter ran towards the trees, and Rigel followed behind him. If Rigel could think of it, he would wonder why he had smelled this strange burning smell rather than the luscious harvest that was set beside him, but that was neither here nor there. For Hunter was here, and any previous confusion was forgotten. Together they ran to the trees, the flashlight still at their feet. The man-made torch went dark, but this small fact seemed irrelevant at this greater delight and discovery. They had enough to see where they were going together, and this was enough for the two of them. And they knew the moon would soon return. Rigel and Hunter disappeared into the forest that had appeared before them. As they did, the sky cracked with a boom. Neither Hunter or Rigel were there to witness it, for they were sheltered by the forest that had been created. It was the coyotes and owls who greeted this astronomical bomb, suddenly shaken awake from forces they knew nothing of. They howled and hooted, their voices echoing louder and stronger than their usual song. The reasons for this sudden concert were as murky and mysterious as the strange female entity who shook the balance scales at the dog Rigel. Perhaps it was because they wanted to make amends for slacking off for keeping mute during their assigned nocturnal vigil. Or perhaps, like Rigel, they vainly competed against a superior auditory voice. Regardless of the motive, they played a muted harmony in the second movement of a symphony they had been unaware of until now. In this great orchestra, the boom that had awakened the canines and owls resounded through the high woods and sloped downwards throughout the valley. As the sonic interloper completed its swoop, the first crescent of the moon peaked from behind its shadow. It was now time for the moon to awaken from its sleep, just like the coyotes that had preceded its entrance upon the celestial stage. And so the moon arrived once more in the sky, doing its assigned duty at the proscribed time. But despite its reappearance, all the residents remained asleep, deep in slumber. There was no reason for them to awaken, because all the signs seemed to mean nothing and darkness was a time for sleep. Even a boom ripping through the atmospheric umbrella protecting them was too much of a hassle, when their souls were already wracked in psychic noise pollution. It was so easy to turn a deaf ear in the midst of dark saturation that resembled a white noise of chaos. Uninhibited, the ghouls, ghosts, goblins, goons and other demons of the night continued their dominance. They had conquered the valley for the duration of the night, dancing in the spotlight of the moonlight their frenzy of victory. Everything in the valley was their dominion, even the spiders who once more came to life and danced in their webs. And the moon watched over them as they continued their reign in the night. The demons and their sidekick minions reveled in the light that was theirs. Even Orion was now hidden in the shadow of the moon’s brightness, disappeared from all detection human or otherwise. But even with all this, the hunter of the sky had not completely disappeared. It only waited for its appointed time to conquer the cosmic stage, protected by a forest of light that few had eyes to see. The part that Orion would play was just beginning. At the moment Orion went into hiding, all that was meant to take place had been completed exactly as planned. Everything had been aligned just as it had been proscribed to do. Every single actor had fulfilled its part. Thus perfect order was created on this the night of the blood moon rising from the east. The moon smiled with a face of light, a faithful servant who had acted as it had been proscribed to do.